Yesterday, I bought this because my grandchildren have reached the age to enjoy the contents; and, in a couple weeks, I'm expecting my 3 year-old Brooklyn granddaughter. The plastic carrying case would work as a portable 8 1/2" by 11" inch manilla file box. I've bought several of these empty file boxes on sale for around $8 each at the office supply store, and I'm happy to have another. 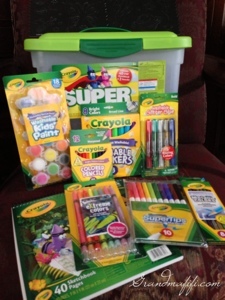 This set has SEVEN Crayola sets of various kinds, including markers, crayons, glitter glue, a large kids' paint set (including paint brush), and colored pencils. The set does not have a box of standard, regular, everyday crayons. The sketch pad is small, 40 pages, so, to fully use all the colors/glue, we will need more paper. Two small sheets of stencils are included. My Detroit granddaughter enjoyed playing with the Hello Kitty stencils, so maybe these, in the Crayola set, will be fun. One is butterfly, hearts, and flowers; one is rocket ship, stars, and planets. The Crayola Super Art Tub seems like a good purchase to me; but I have a feeling we're going to be art-supply-rich for a long time. Maybe I better start playing with it myself, just to test everything.